DENVER, CO--(Marketwired - March 30, 2016) - Elizabeth Edwards, founder, president and CEO of Volume Public Relations, will join a group of PR expert speakers at the Public Relations Society of America (PRSA) Western District Conference in Orange County, California. Edwards, and her peers from brands like Taco Bell, Disneyland, General Motors and Toshiba, will address "The PR Futurist: Embracing Industry Evolution" during the two-day conference. PRSA selected Elizabeth Edwards of Volume PR to present a session in which she will explain how communication professionals can improve outcomes with an awareness of the laws of human behavior, and how they impact and interplay with communicators' messages and strategies. "Today's always-on culture leaves people distracted and bombarded with messages that generate noise and confusion without prompting action. By understanding and applying human science knowledge to PR, marketing and integrated communication campaigns, brands and practitioners can drive goal shattering results and foster incredible brand loyalty," said Edwards. PRSA is leading the evolution of the industry, continuing to prime communicators to create the very best campaigns. This year, the Western District Conference focuses on the incredibly important discussion around embracing the evolution - addressing the need for practitioners to develop more precise strategies and more impactful results. The incredible line-up of speakers will give attendees a glimpse into great minds like: Brian Solis - forerunning social business and social media strategist; Todd Brooks - co-founder of Brand Amp; Suzi Brown - media relations director for Disneyland & Erin Glover - social media director for Disneyland; Mark W. McClennan - PRSA president; and a special panel including law enforcement and reporters from San Bernardino. Edwards leads Volume PR on the premise that sales and marketing professionals can apply behavioral and cognitive science to marketing communications, integrating psychology, neuroscience, and sociology to design more effective public relations and marketing programs. Volume PR has perfected a scientific methodology to uncover key messages and marketing and public relations strategies that engage, excite, and entice a target audience to promote positive action. By developing what Volume PR calls Human-to-Human (H2H) strategies, organizations can create precise messages and programs that cut through the noise of today's media to build brand awareness and increase market penetration. What: "Driving Maximum Results by Rooting PR in Human Science"
PRSA Western District was founded in 1955 and operated under that name until 1969. In 1970, the district was split into North and South Pacific Districts. On May 11, 1996, the South Pacific District was renamed the Western District. This is a first-come, first-serve opportunity for members of the communications community to learn from PR futurists, network with peers and establish relationships that will help skyrocket your career - all set in one of the best vacations spots, Huntington Beach, California. The only thing more dynamic than the conference may be the pristine beaches, roaring ocean waves and legendary beach vibe of Surf City, USA. You'll be able to take in conference highlights while watching Instagram-worthy sunsets from the four-star oceanfront Hyatt Regency Huntington Beach Resort & Spa, located on the famed Highway 1. Volume Public Relations is an award-winning strategic communications firm known for accelerating marketing, PR and integrated communication outcomes with scientific precision. The Volume PR team creates more awareness, more customers and more results for its client by designing messages, strategies, brands and public relations campaigns that are rooted in the principles of behavioral and cognitive science. This practice has created an unmatched reputation for producing precision campaigns and outcomes over the last 15 years. Whether working as an equal partner to existing agency partners, providing senior strategic assistance to an in-house team or serving as your communication Agency of Record, Volume PR brings a scientific-based approach to every communication program. Executives at brands from BMW to Level3 Communications have trusted Volume's strategy to drive guaranteed and unprecedented results for their organizations. Come get to know us at www.VolumePR.com. 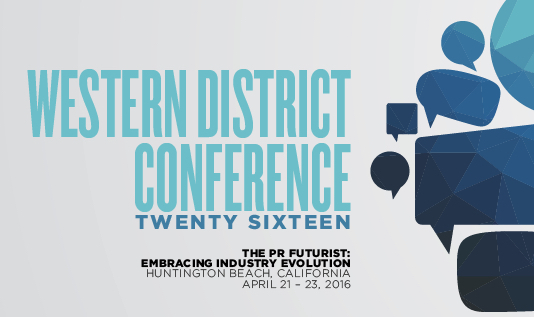 Elizabeth Edwards, Volume PR, invited to speak at the 2016 PRSA Western District Conference.